In a time before shot clocks and three point field goals, Mike was a key figure in one of the most exciting eras of Hurricane basketball. 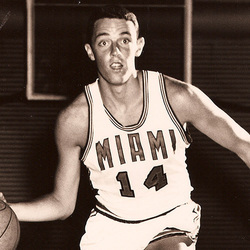 Playing for the legendary Coach Bruce Hale, as a Sophomore, along with All-American Rick Barry, he helped the Canes establish a then-NCAA record scoring average of 98.4 points per game. That 1964-65 team scored 100 plus points 10 times, including a school record 148 points against Rollins. In 1965-66, Mike took over the reins and led the team in scoring and rebounding. He averaged 22 points a game in both his Junior and Senior seasons, and in his final campaign, shot 80% from the free throw line and 48 % from the field. He was named Team MVP both years. His 585 points (66-67) and 567 points (65-66) were the 4th and 5th highest totals at that time. His 1,319 career points was the 4th highest total in the program's first 40 seasons. He may have saved his best for last, scoring 20 points and grabbing 20 rebounds in a 20 point victory over arch rival FSU! He still ranks in U.M. 's Top Ten Lists for career field goal percentage, field goals made, free throw attempts and free throws made. He ranks 6th all time with 33 games of 20 plus points, and had 4 games of 30 plus points his last season. After graduating with a BA in English Literature, he was drafted in both the NBA's and ABA's professional drafts. He opted to play for the Phillips 66ers and Akron Wingfoots in the National Industrial Basketball League, where he was a first team All-League in 1968. Mike has spent the last 40 years broadcasting TV sports. Recognized as the "father of aerial sports broadcasting with Goodyear", he has covered over 2,500 live sports events from the Goodyear Blimp, including 6 Olympics, 30 World Series, 25 Indy 500's, 26 Super Bowls and dozens of college bowl games, including 3 of Miami's National Championship games. As Director of Aerial Sports Broadcasting, he introduced the first gyro-stabilized camera. He lives in St. Joseph, Michigan with his wife, Susan. They have three daughters, Paige, Alex and Colby.